Following in TAKARA-TOMY’s footsteps, we have decided that effective May 15th, the Dark Deathscyther and Deathscyther Layers are now banned from Burst Format in WBO Organized Play Events. Both Layers have been banned due to their extreme overall power, versatility, and unhealthy influence on the diversity of Burst Format. These bans will be reviewed as new products are released. To help our continued review of these parts easier, we encourage everyone to continue testing with them and posting results in the Burst Customizations forum. However, for the time being we are optimistic that their absence from the game will allow for new parts and strategies to shine that may not have been viable before. Note: this ban does not include Hasbro’s Dark Doomscizor or Doomscizor Energy Layers. Foreign Substance - Nail Polish Clarification: We have added clarification stating that it is legal to apply a thin coat of nail polish to the stickers of your Beyblades for aesthetic purposes to protect them. Foreign Substance - Marking Parts Clarification: We have added clarification stating that making small marks on parts with pen/marker for the purpose of identification and being able to maintain parts orientation in the event of your Beyblade bursting/disassembling during a round is legal. Homemade/Unofficial Stickers: We have added clarification that only stickers included with officially released or licensed by Hasbro or TAKARA-TOMY (and SONO KONG in the case of Plastics/HMS/MFB) may be used on your Beyblade. Sticker Placement: We have added clarification regarding where stickers may be placed on your Beyblades. Generally speaking, you must follow the positioning as is outlined with the instructions included in each product. For more precise details, see the rulebooks or description below. Brand Incompatibility (Burst Format): We have added clarification regarding the usage of parts that have been previously mixed with other brands. This means you cannot use a Hasbro Energy Layer in WBO Organized Play if it has been previously used with a TAKARA-TOMY Driver in testing or free-play and vice-versa with TAKARA-TOMY Layers and Hasbro Performance Tips. Particularly in the case of using a Hasbro Energy Layer that has been forced to fit on a TT Driver with a Hasbro Driver again, a higher burst resistance is created as a result of the damage that is inevitably created by forcing it onto a TT Driver previously. Hasbro Burst Format: This was made official a while back, but we have now added a section to the Burst Format Rulebook outlining the rules. Organizers’ Guide - Beyblade Inspection: We have made some significant structural updates and additions to the “Judging a Match” section. It is now split into two major sections: “Before the Match” and “During the Match”. There are clearer and more detailed instructions and expectations for judges regarding Beyblade selection and inspection contained within the “Before the Match” section. All organizers, judges, and players should read the detailed description below or in the Organizers’ Guide before their next event. You can find the exact wording included in the rulebooks below. There may be slight variations in these descriptions depending on the format. Please reference the full rulebooks for each format. The Layers Deathscyther & Dark Deathscyther are currently banned from use in World Beyblade Organization events due to their extreme overall power, versatility, and unhealthy influence on the diversity of Burst Format. These bans will be reviewed as new products are released. Note: this ban does not include Hasbro’s Dark Doomscizor or Doomscizor Energy Layers. ’All Rulebooks - Legal Equipment Red Illegal Section’ Wrote: Foreign Substances: Beyblade parts cannot be painted, coated, or physically modified in any way except in the methods explicitly outlined in the green section below. Bladers who intentionally modify the performance illegally of their equipment will be disqualified and potentially banned from future WBO events. Burst Format Rulebook - Legal Equipment Red Illegal Section’ Wrote: Sticker Placement: Stickers cannot be placed anywhere where two parts of the Beyblade come into contact with each other. You must respect the legal sticker positioning as instructed by TAKARA-TOMY in each Beyblade Starter and Booster product. In other words, these are the only placements accepted: for Layers, follow the sticker guide of that specific Layer; for the Disk, apply star stickers only on the bottom, outward ring, not inner, and ideally just on the embossed stars; for the Driver, only on the small center with the embossed letter. As the only exception to this rule, you may place one star sticker on the top of a Layer near the center and on the outward perimeter on the bottom of a Driver for identification purposes. Burst Format Rulebook - Legal Equipment Red Illegal Section Wrote: Brand Incompatibility: Hasbro Energy Layers cannot be used with Takara-Tomy Drivers, and Takara-Tomy Layers cannot be used with Hasbro Performance Tips. This applies to official battles in WBO events, and parts previously used in testing in a mixed brand combination. The slopes on Hasbro Energy Layers that have played with TAKARA-TOMY Drivers inevitably are damaged, increasing their burst resistance illegally. Burst Format Rulebook - Legal Equipment Red Illegal Section Wrote: Homemade/Unofficial Stickers: Only stickers included with officially released Hasbro or TAKARA-TOMY products (or products licensed by these companies such as stickers by ensky for Beyblade Burst, or stickers included in Coro Coro magazines) may be used on your Beyblade. If a judge determines you have used homemade/unofficial stickers, you will be obligated to switch out the part for another version of the same part with no homemade/unofficial stickers applied. If you cannot, you will be given a match loss. Burst Format Rulebook - Legal Equipment Green Permitted Section Wrote: Applying Nail Polish to Stickers: Applying a thin coat of nail polish to protect the stickers of your Beyblade for aesthetic purposes is permitted. However, if a judge determines you have applied a copious amount of nail polish to the point where it might significantly impact the weight of your Beyblade, you will be obligated to switch out the part for another version of the same part with no nail polish applied. If you cannot, you will be given a match loss. Burst Format Rulebook - Legal Equipment Green Permitted Section Wrote: Marking Parts: Parts may be marked in order to differentiate parts from your opponent’s in the event of a double Burst Finish, or to maintain the orientation of your combination’s parts should it burst and need to be re-assembled. Stickers may be used to do this, but must follow the rules outlined under “Sticker Placement” above. Alternatively, you may apply minor markings (single lines or dots) to them with a pen or marker. Marking parts in this manner is permitted, but you may not draw on your parts for aesthetic purposes. Other methods of marking not explicitly outlined here are not permitted and will be considered a “foreign substance” as defined by the section above. During this phase, ensure that players are positioned across from each other at the designated BeyStadium, with their backs turned. Bladers have 3 minutes to complete their selection. Verify that parts are not fake. Parts must be produced by Hasbro or TAKARA-TOMY (or SONOKONG in the case of Plastics, HMS, and Metal Fight Beyblade). Verify that parts have not been tampered with. 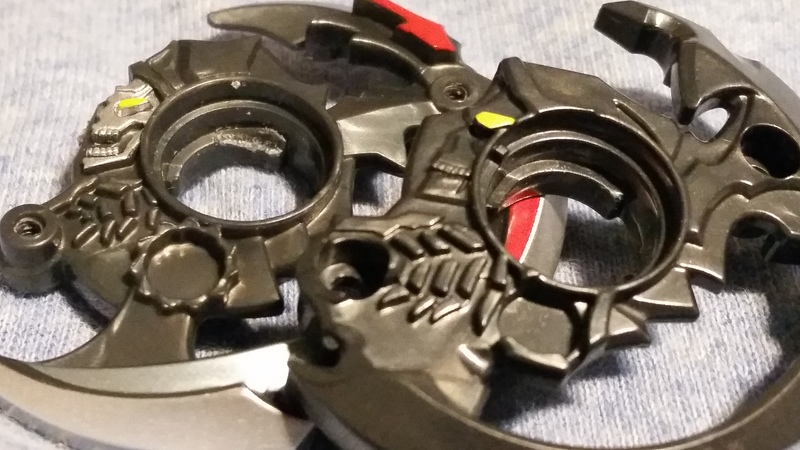 Any foreign substance applied to a Beyblade part other than those explicitly outlined in our rulebooks (for Burst Format specifically, minimal nail polish for stickers, minimal pen/marker for marking parts, or official stickers in their proper spots as defined by TAKARA-TOMY are permitted. See other rulebooks for additional format-specific rulings) are considered illegal. In Burst Format, Verify TAKARA-TOMY Layers & Drivers and Hasbro Energy Layers and Performance Tips are not and have not ever been mixed. TAKARA-TOMY Layers have teeth on their underside, while Hasbro’s have slopes. TAKARA-TOMY Drivers have slightly taller teeth on top of them than their Hasbro counterparts and will produce a tighter fit with Hasbro Energy Layers. And vice-versa with Hasbro Performance Tips; because of their shorter teeth, the fit with TAKARA-TOMY Layers will be looser. Even if the combination presented by a player does not mix brands, inspect the parts to ensure that they have not previously done so in other matches or testing. The slopes on Hasbro Energy Layers that have played with TAKARA-TOMY Drivers inevitably are damaged, increasing their burst resistance illegally. After completing the inspection of the Beyblade Parts, give them back to the player, unassembled. Test the number of rotations on their selected launcher (30+ Participants: Mandatory, 29 or less participants: Optional). If there is any more or less than the amount specified below, the player must change their launcher to one that has a legal number of rotations. Once you have inspected the selected Beyblades and launchers of both players, have them turn around to face each other at the BeyStadium. Ensure that neither blader takes up more than half of the play area while positioning their launcher. Quickly ask bladers if they are ready before calling down “3–2–1 go shoot.” Bladers must launch as the word shoot is called. Always keep your eyes on the battle. Battles can end suddenly or be decided by a fraction of a second difference. During and after each round, ensure that players do not touch the BeyStadium. After each round, ensure that the orientation of the BeyStadium as it was when the players arrived and positioned themselves before the match. The BeyStadium–especially in Zero-G Format–can shift dramatically from round to round depending on the battle in play. After each round, players may not touch their Beyblades until the judge has announced the winner. In the case of Burst Format, a judge must inspect the winning Beyblade to ensure that it did not skip all of its teeth and remain intact. If this is the case the result of the round is reversed and the “losing” Beyblade is then considered the winner for the round. If it is found that a Layer has skipped all of its teeth and did not burst after the conclusion of a round, the player using that Layer must then replace it with another version of the same Layer. If the player cannot do this, they are given a match loss instead of a round loss. Is TakaraTomy ReBoot which have springs problems legal in Burst Tournament? (May. 14, 2017 2:36 AM)Ninja Blader Wrote: Is TakaraTomy ReBoot which have springs problems legal in Burst Tournament? Just to note in case anyone was wondering and looking for things like the launcher rotation chart: the rulebooks/Organizers' Guide themselves have not been updated yet ... will try to do this tonight or tomorrow and will post once they've been updated. No, actually they are not. For Hasbro Only Burst Format TT Disks are legal, but must have been released by Hasbro. Thanks for pointing that out cosmicstriker! I will update it. So once I'm set do I show the judge which parts I'm going to use then once they give me the "your combo isn't illegal" then I assemble it and attach it to mu launcher? (May. 14, 2017 1:04 PM)SUGOI-KONICHEWA Wrote: So once I'm set do I show the judge which parts I'm going to use then once they give me the "your combo isn't illegal" then I assemble it and attach it to mu launcher? This at the discretion of the judge, in my opinion. If looking at the parts disassembled isn't conclusive to them, they are allowed to put it together as their last resort. If anything, the main instance where you might want to do this is if the player is using a Hasbro Energy Layer which may or may not have been previously used with a TAKARA-TOMY Driver ... but even then you're doing this because there is no visible damage on the slopes of the Hasbro Energy Layer, whatever tightness the combo has might be due more to the Disk in use than anything else in my experience. Otherwise, I can't think of any reason why a judge would want to assemble the Beyblade if it doesn't look like the parts themselves have been tampered with. Angry Face, I know you have the more experience with the Hasbro Energy Layer/TT Driver issues than I do, so I'm curious what your thoughts are on this. Is the damage created by this usually visible on the Energy Layer? All of the rulebooks and Organizers' Guide have now been updated. View them all here. - Supergrip Launcher (Burst) - For this one is it just the same as the regular Hasbro Burst Launcher but with a longer winder? And if there's any launchers we've missed, please let us know after you look at the full chart in the Organizers' Guide. I'm sure there's some obscure launcher we've missed haha. (May. 15, 2017 1:48 AM)Kei Wrote: - Supergrip Launcher (Burst) - For this one is it just the same as the regular Hasbro Burst Launcher but with a longer winder? Also, quick question, would it be legal to use the Supergrip winder on a standard Hasbro burst launcher? I doubt it would be illegal, but I just want to make sure. @[Angry Face], I know you have the more experience with the Hasbro Energy Layer/TT Driver issues than I do, so I'm curious what your thoughts are on this. Is the damage created by this usually visible on the Energy Layer? The sign that a Hasbro Energy Layer has been used on a Takara-Tomy Driver is damage to its slopes like on this Doomscizor D2's. The Doomscizor Under Layer beside it hasn't been forced into a Takara Driver, so it's undamaged. Thanks! I remember you shared that photo somewhere before now. I've actually gone ahead and added it to the Organizers' Guide as an example. But yeah, if that is what it looks like, I don't think a judge assembling the Beyblade after already inspecting the parts individually will usually be necessary. Thanks! Yeah so to confirm, you could technically use the short winder in the Supergrip Launcher and the long one in the regular Hasbro launcher, correct? They are the same winder just different lengths? If that's the case, the answer to your question is "yes". (May. 15, 2017 2:14 AM)Kei Wrote: Thanks! Yeah so to confirm, you could technically use the short winder in the Supergrip Launcher and the long one in the regular Hasbro launcher, correct? They are the same winder just different lengths? If that's the case, the answer to your question is "yes". I have a sprizin that is all scratched up along the edges of the top piece does that degrade the performance. (May. 24, 2017 12:46 PM)Hellfire Wrote: I have a sprizin that is all scratched up along the edges of the top piece does that degrade the performance. How could it be that scratched? It sounds like something and, therefore, still legal, but you should post a photograph so we can really see what you are refering to. Don't you mean Odin, Wyvern and Valkyrie? More like buy 1000 Odins and choose 2 cause they're "perfect"
And mix and match the spinning part 4 maximum looseness. Mislaunch every time with your perfect OHR at a tournament. Parts hit the wall and become imperfect. Well theres neptune and blaze ragnarok too they are also pretty good. Doomscizor D2 is Hasbro's version and it is not as overpowered at all, and Obelisk Odin is barely top-tier in Attack. You probably meant Odin. Does this mean Odin is now legal, or is it still banned from play. Also is there any part bans that we should expect from the committee in the future.